The inquiry is still informal, but was discovered in documents provided to the Los Angeles Times. The SEC itself has refused to confirm or deny anything, but the school district said it recently met with an SEC attorney, and also that it believes it dealt with the agency's concerns. Before it was abandoned, the effort to distribute iPads among L.A. students was valued at $1.3 billion. The LAUSD is asking for millions of dollars in refunds from the project's main partners, Apple and Pearson, as well as two other companies, Lenovo and distributor Arey Jones. It's threatening legal action if it can't reclaim the money. Pearson appears to be main target of the LAUSD, since it did not have curriculum content ready before the start of the iPad project, and never delivered everything promised. In March an internal memo complained that only two out of 69 schools were using Pearson digital materials regularly, while the rest had "given up on attempting regular use of the app." LAUSD officials have expressed a willingness to meet with the likes of Apple and Lenovo to discuss reclaiming cash from Pearson. The FBI is pursuing a criminal investigation into whether Apple and Pearson were given an unfair advantage towards winning LAUSD contracts. The debacle led to the October resignation of former district superintendent John Deasy. 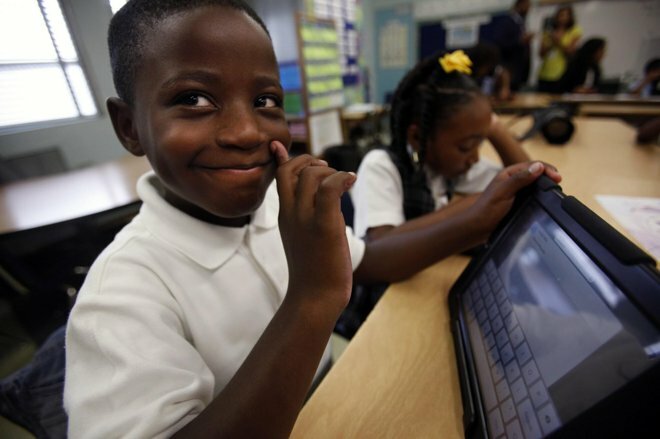 Since last year the district has begun using other devices in schools, such as Chromebooks and the Microsoft Surface.